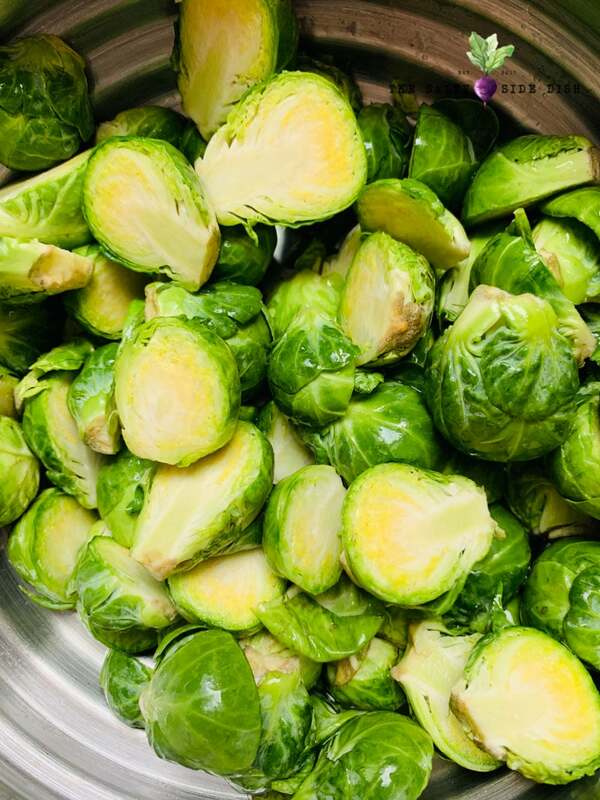 Buffalo Brussel Sprouts, a crispy, crunchy and perfect way to enjoy a brussel sprout, can feed a crowd and then some. 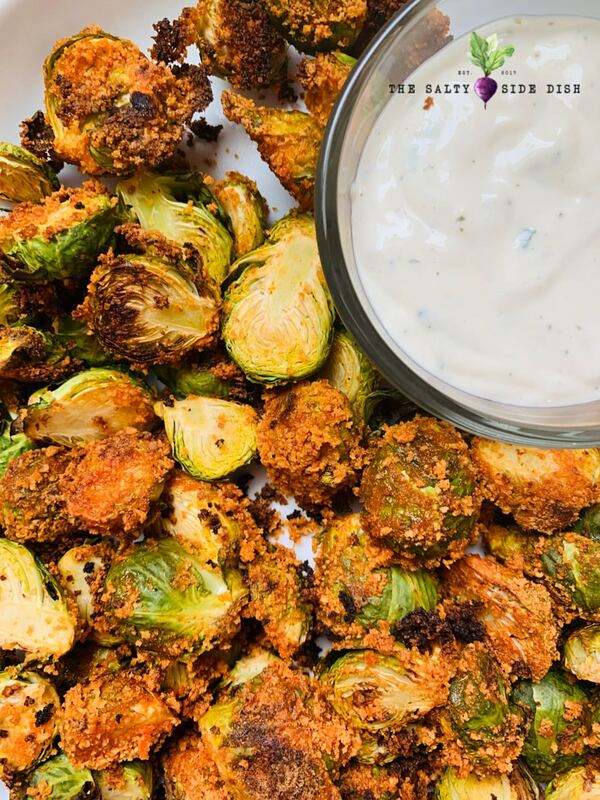 This buffalo breaded tiny bite of veggie will change your mind about traditional brussels sprouts and keep you, and your guests, coming back for more. When it comes to recipes, nothing beats simple ingredients that taste great. 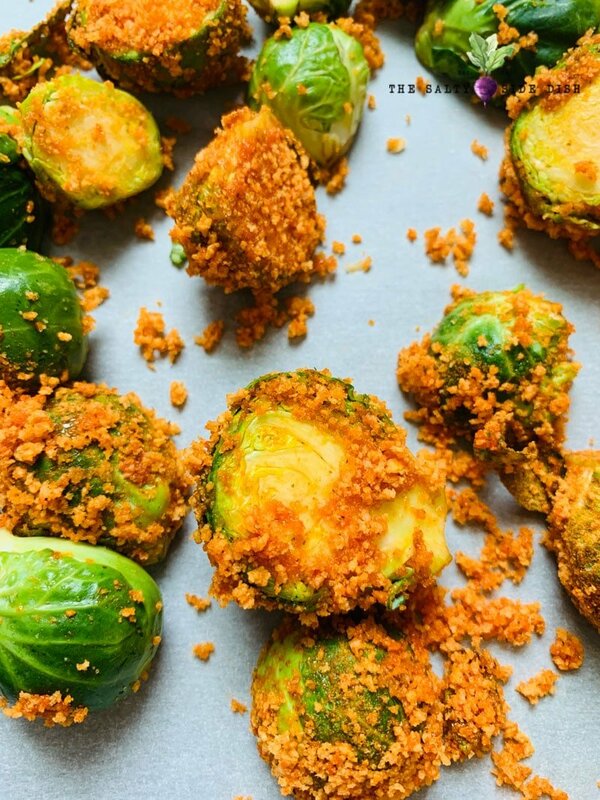 So recently when I threatened to throw some buffalo breading and roast up some brussels sprouts, I was actually a little surprised at how GOOD they were. Like “make more than one time” good! Who knew scanning my pantry and being lazy would pay off! 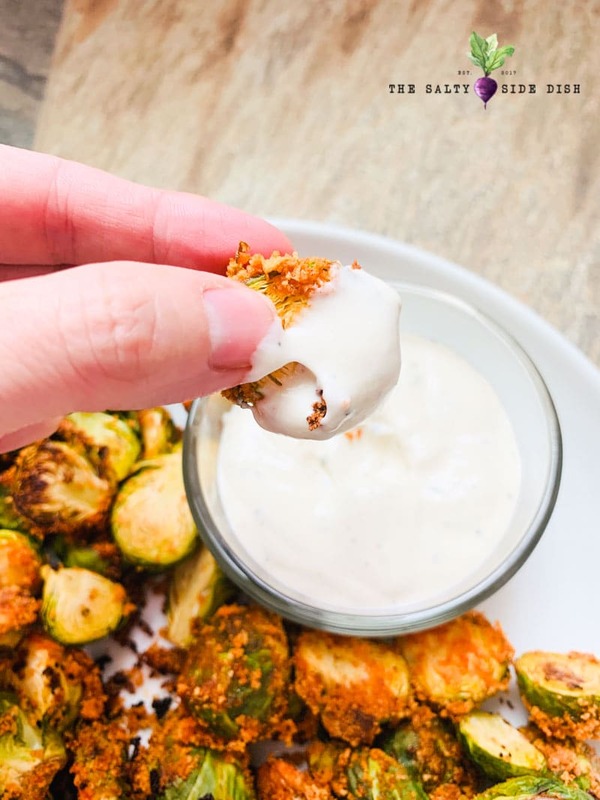 These buffalo brussel sprouts are a super flavored, super crunchy, and not too spicy bundle of goodness. This delicious treat is perfect as an appetizer or a side dish. I actually ate them for lunch today and along with some fresh ranch dressing, was the only thing I needed to put me into a serious food coma. In fact they are so good that you might even get your kids to test them out! 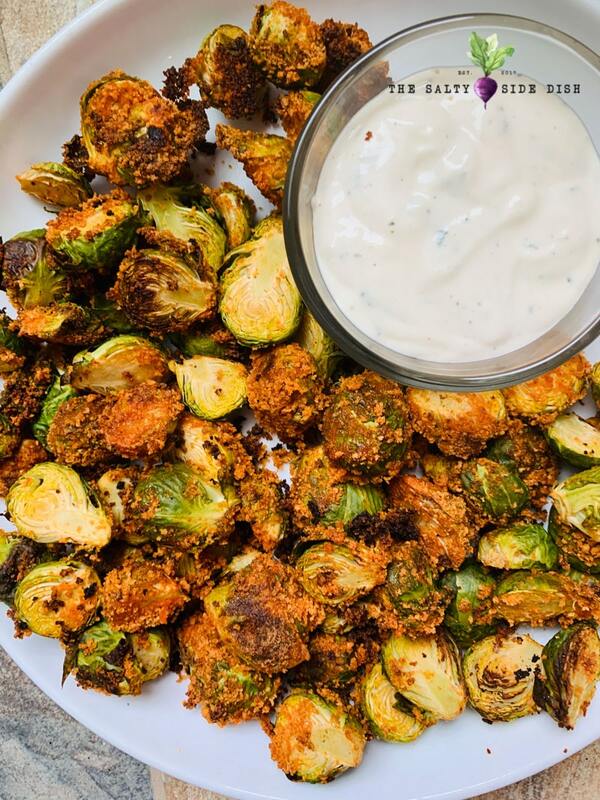 There is no bitter brussels sprouts flavor, they are roasted, not fried and contain zero oil or butters. I cannot call breading of any kind “healthy” but its way better then most of the alternatives and I feel super guilt free eating them. Plus with only 2 ingredients and 15 minutes needed, you can go from reading this recipe to eating in mere minutes! * I use the Great Value Buffalo Coating and Seasoning Mix from Walmart. It’s got a good crunch and is not overly spicy. 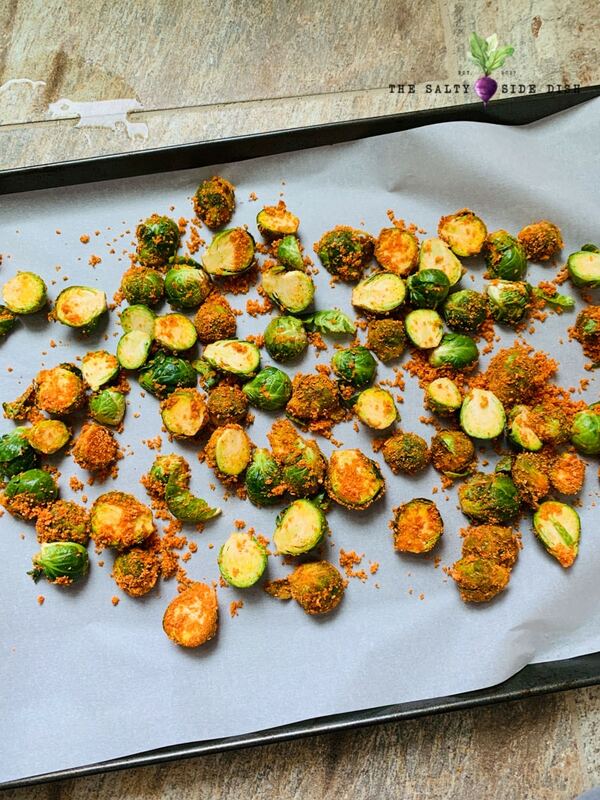 Cut your brussels sprouts in half. I find that a serrated knife works best. Put in a strainer and rinse. The water will help your buffalo coating stick! This will keep your buffalo brussels sprouts from sticking to the pan and not burn. Mix your wet brussels sprouts and seasoning together in the bag until fully coated. 1 Pound of veggies can be quite a bit if you use the bag that comes in box so you may need to transfer to a gallon size ziplock or move them around to make sure they are coated. Dump onto your baking sheet and spread out. Bake for approx 13-15 minutes, turning half way in between. I like to make a fresh cup of ranch dressing to serve. 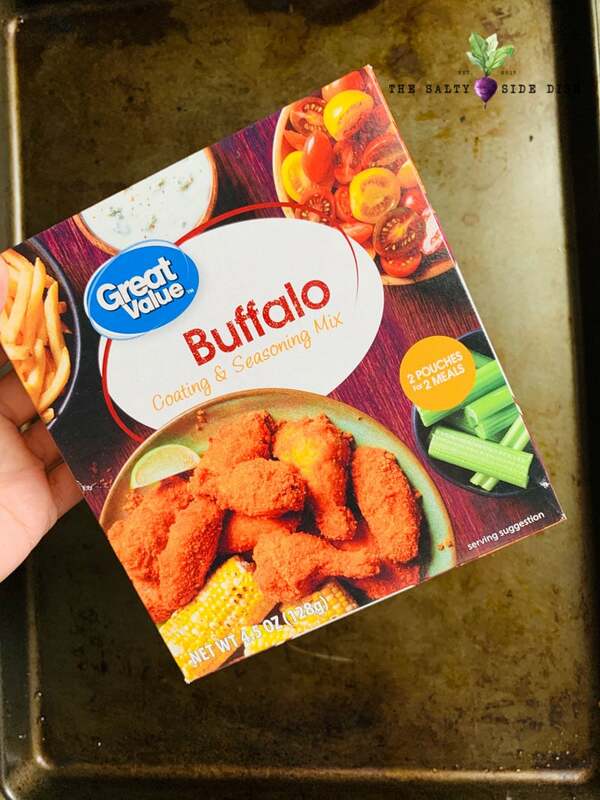 * I use the Great Value Buffalo Coating and Seasoning Mix from Walmart. It's got a good crunch and is not overly spicy.